Your Vesper Marine XB-8000 is an AIS transponder with built-in NMEA 2000 gateway, fast navigation GPS, and WiFi. If you haven't registered your product with us, please register now. By registering your Vesper Marine XB-8000 AIS Transponder we'll be able to provide you with fast technical support and warranty service. You'll also be able to keep up-to-date with free firmware updates. Free iPad, iPhone and Android App! 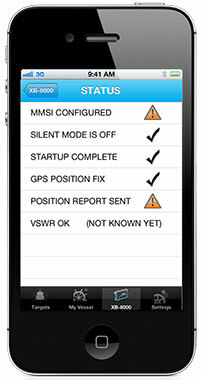 The Vesper Marine WatchMate app is a great way to configure and monitor your XB‑8000 AIS transponder. Use your tablet or phone to view or update your vessel information, monitor transponder and GPS status, and show all AIS-equipped vessels on an easy to use "radar" plotting screen. This is the only mobile app with instant target acquisition. 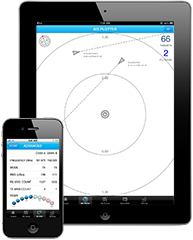 All other apps take time for AIS targets to appear, but the Vesper Marine app takes advantage of unique capabilities inside your XB-8000 allowing it to display all received targets immediately when you start the app. 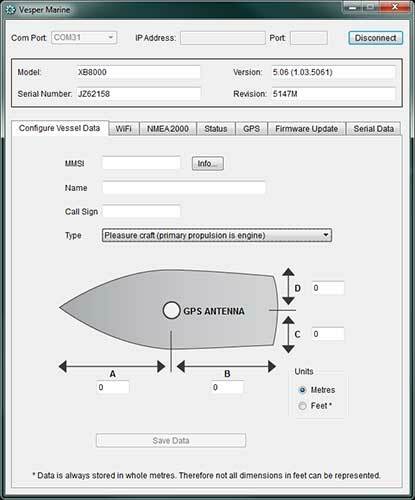 A full-featured vessel plotting tool and remote control for your Vesper Marine AIS transponder! The XB-8000 Installation Guide has important information about wiring and antenna placement. The install guide shows how to connect an optional switch to place your XB-8000 in Silent Mode. 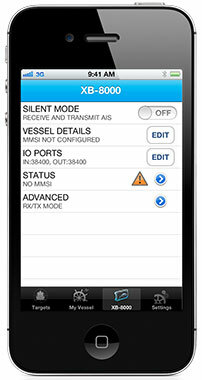 This mode allows your XB-8000 to continue to function as a GPS and AIS receiver but will not transmit your vessel's position or other information. This is useful for those times when you wish to remain private. You can also control silent mode from the vmAIS Configuration and Status Utility (see downloads section) or the Vesper Marine WatchMate App for iPhone and iPad or Android phones and tablets. The GPS smoothing feature is optimized for vessels that do not exceed 45 knots. If you have a fast vessel then you must disable the smoothing feature. Otherwise, you will lose your GPS position when travelling in excess of 48 knots. To do this, download the vmAIS Configuration and Status Utility (see downloads section) and install it on your your PC, Mac or Ubuntu. You can connect to your XB-8000 via USB or WiFi. Select the GPS tab and untick the Smoothing option. Refer to the XB-8000 Installation Guide for details about the Status LED. In normal operation the Status LED will be solid green. During the first minute startup period it will be solid orange and flashing orange when it is acquiring a GPS fix. For further details and troubleshooting you can use the vmAIS Configuration and Status Utility (see downloads section). To use the utility, download and install it on your PC, Mac or Ubuntu computer. You can connect to your XB-8000 via USB or WiFi. Select the Status tab to determine why the Status LED is not green. All status items must be ticked. You can also use this page to view the antenna VSWR and various statistics for each AIS channel. 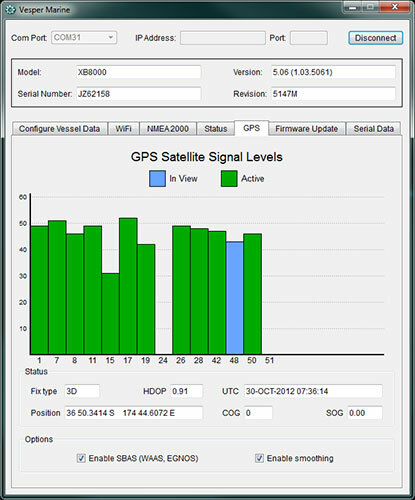 The GPS tab is used to view the current satellite status and may be used to help determine the best location for the GPS antenna. Your XB-8000 will not transmit until your vessel details have been configured. Your dealer may have already configured this information for you and this procedure can be used to verify the information is correct. You must have an assigned MMSI number for your vessel. If you don't have an assigned MMSI, contact the relevant authority in your country. Once you configure your MMSI number you cannot change it. If you need to change the MMSI, please contact an authorized dealer or Vesper Marine. Your vessel details may be configured or viewed using either the Vesper Marine WatchMate App for iPhone and iPad or Android phones and tablets. You may also use the vmAIS Configuration and Status Utility (see downloads section). To use the utility, download and install it on your PC, Mac or Ubuntu computer. You can connect to your XB-8000 via USB or WiFi. Once you have connected, choose the "Configure Vessel Data" tab where your current details will be displayed. Enter your MMSI and other details carefully since this information is transmitted to all vessels within range. Select the most appropriate vessel type and enter the location of the GPS antenna. You may enter the location in either metres or feet. Measurements in feet are converted to whole metres for transmission. As a result, not all measurements in feet can be represented. 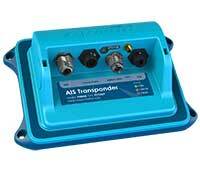 Your XB-8000 transponder comes already configured as an Access Point. This is the most common way to use the XB-8000 and it allows you to connect up to 5 other devices via WiFi. A separate WiFi router is not needed. 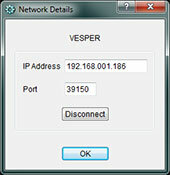 The default network name (SSID) is VesperXB. Select this name from the WiFi connection screen on your other devices. The default password is printed in your owner's manual. You can change the SSID or password by using the vmAIS Configuration and Status Utility on a PC, Mac or Ubuntu computer. Vesper Marine recommends you change the password. To do this, download the vmAIS Configuration and Status Utility and install it on your PC, Mac or Ubuntu computer. Use the USB cable that is included with your XB-8000 transponder to connect to the PC. Some versions of Microsoft Windows have the driver pre-installed, but if not or if installing on Mac OS and you need the driver, you can download it. You must use your XB-8000 USB connection to make changes to the WiFi configuration. Once you have installed the software and connected the XB-8000 via USB you can run the vmAIS Configuration and Status Utility, select the proper COM port and press the Connect button. The COM port is displayed when the USB is first plugged in. It will remain the same even if you unplug it and plug it in again later. Select the WiFi tab, enter your new password and press the Save button. If you have an existing WiFi router, you can configure your XB-8000 to connect to it rather than create its own network. This allows you to maintain a single network connection on your other devices without having to switch networks to get access to your XB-8000 transponder. This also allows for larger networks than the 5 devices supported by the XB-8000 in its Access Point configuration. 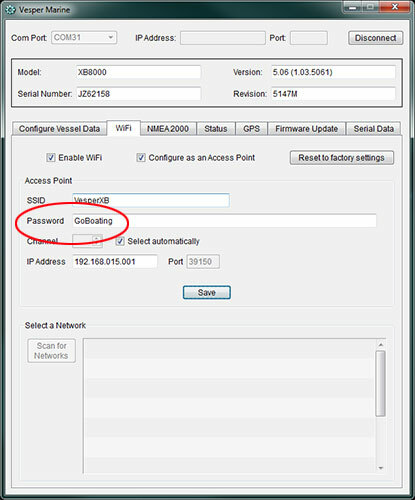 To configure the XB-8000 to join an existing network use the vmAIS Configuration and Status Utility on a PC, Mac or Ubuntu. To do this, download the vmAIS Configuration and Status Utility (see downloads section) and install it on your PC, Mac or Ubuntu. Use the USB cable that is included with your XB-8000 transponder to connect to the computer. Some versions of Microsoft Windows have the driver pre-installed, but if not or you are running on Mac OS and you need the driver, you can download it. You must use your XB-8000 USB connection to make changes to the WiFi configuration. Select the WiFi tab and untick the "Configure as an Access Point". It will take about a minute for the XB-8000 to reconfigure itself and display a list of networks within range. You can press the "Scan for Networks" button to update the list if your network isn't shown. Select the network you wish to join by clicking on its name. Enter your network password, if required. 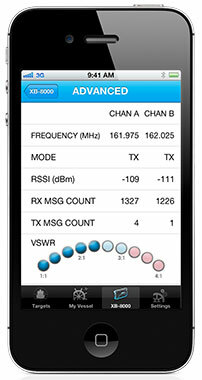 Your XB-8000 transponder supports WPA and WPA2 personal (PSK) WiFi security. The default is to use DHCP which allows your WiFi router to choose the address for your XB-8000. This is convenient but the address can change if you switch your XB-8000 transponder off. 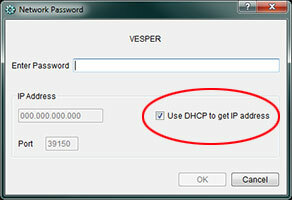 To assign your XB-8000 a static IP address, untick the "Use DHCP" option and enter the IP address you wish to use. This must be an IP address in the correct range which your router has available for use as a static IP. See the manual for your WiFi router for details regarding static IP usage and the correct address to enter. Your XB-8000 will now connect to the network. When it is done you'll see your selected network appear in the list with a tick next to it. If you are using DHCP, you'll need to know the IP address that your router assigned to the XB-8000. Click on the blue "More Details" arrow to see the IP address that has been assigned by your router. You will need this address to connect to your XB-8000 from other devices on your network. This screen also allows you to disconnect from the current network. However, selecting another network from the list will also disconnect your XB-8000 from a previous network. Each time you connect to a network you'll need to enter the password, if required. Getting started with iNavX can sometimes be confusing. You need to install it from the App Store, download free charts or create an account to download additional charts, and configure it for use with your Vesper Marine transponder. To get started, here's a nice tutorial we've come across. If you have more info you would like to share about getting started with iNavX or SEAiq (another good iPad navigation app we've used and can recommend), please let us know at [email protected]. This video takes you through the steps to connect iNavX to an XB-8000 AIS Transponder over WiFi. Once connected, your XB-8000 transponder will supply your GPS position to iNavX and AIS targets will be overlaid on the iNavX charts. 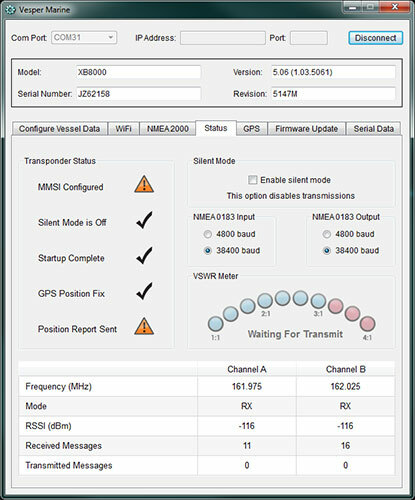 For troubleshooting and advanced installations, you can view the status and adjust the NMEA 2000 configuration. To do this, download the vmAIS Configuration and Status Utility (see downloads section) and install it on your PC, Mac or Ubuntu computer. You can connect to your XB-8000 via USB or WiFi. Once you have connected, choose the "NMEA 2000" tab. This tab shows the current NMEA 2000 connection state. It will be green when the XB-8000 is connected to the bus and working properly. If there is a problem detected on the bus, the status indicator will be orange. If the XB-8000 is not operating on the NMEA 2000 bus the status indicator will be red. Note: It is normal for the red and orange indicators to flick back and forth every few seconds when there is no NMEA 2000 connection to the XB-8000. From this tab you can select which individual PGNs you wish to receive and transmit. For example, you might choose to not output GPS data if your NMEA 2000 network already has another source of GPS data. You can also select the output rate for each PGN in milliseconds. Note: GPS data is updated either once per second or five times per second depending on your configuration settings. If you choose to output the data more frequently the same data will be repeated each time until the next update. A summary of NMEA Translations can be found here. Here's where you'll find wiring diagrams, how to interpret the status LED, information about antenna placement, and connecting NMEA 2000. In this guide there's also troubleshooting information and technical specifications. Install this utility on a PC running Microsoft Windows (XP or later) to configure or check your MMSI & vessel details, change your WiFi connection details, update your NMEA 2000 configuration, monitor GPS and transponder status, assist with troubleshooting and provide for future firmware updates. Install this utility on Mac OS X (10.7 "Lion" or later) to configure or check your MMSI & vessel details, change your WiFi connection details, update your NMEA 2000 configuration, monitor GPS and transponder status, assist with troubleshooting and provide for future firmware updates. 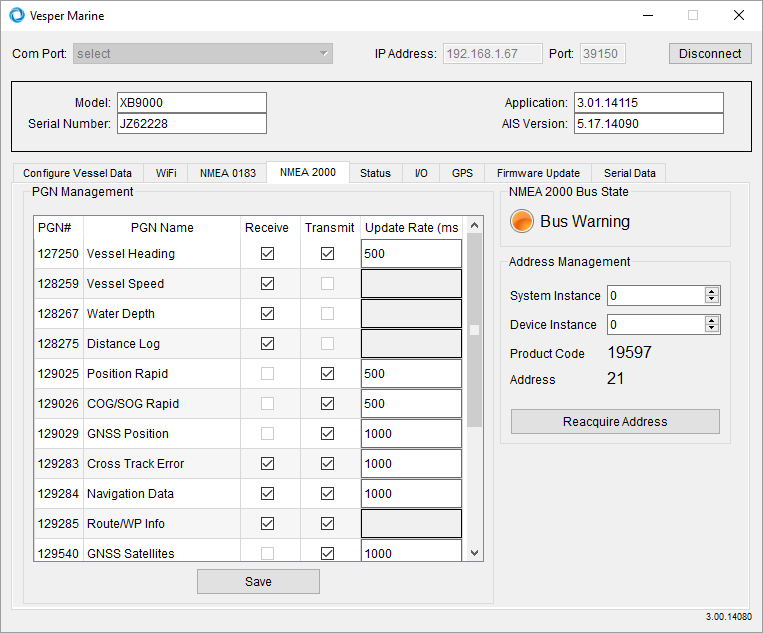 Install this utility on Ubuntu (12.04 or later) to configure or check your MMSI & vessel details, change your WiFi connection details, update your NMEA 2000 configuration, monitor GPS and transponder status, assist with troubleshooting and provide for future firmware updates. Recent versions of Microsoft Windows includes the USB drivers. However, if your system does not have them installed you can download them from here. These drivers are supported on Windows XP, Windows Server 2003, Windows Vista, Windows Server 2008, Windows 7, 8, 8.1, 10, and Windows Server 2008 R2. The latest USB drivers for MAC OS X. Support is included in Ubuntu 11.10, kernel 3.0.0-19. These are the USB drivers you can build for other Linux versions. Firmware updates are frequently available to resolve issues and add new features. Please request the update instructions. What iPad, iPhone and Android apps can I use with it? In addition to the Vesper Marine WatchMate for iPhone and iPad and the Vesper Marine WatchMate for Android , there are a growing set of 3rd party mobile apps for your phone and tablet that support Vesper Marine transponders with WiFi. We frequently post reviews of iPhone, iPad and Android apps for compatibility and features. If you know of other good mobile apps that work with AIS and GPS over WiFi (TCP connection), please let us know so we can have a look at them. What PC and MAC navigation software can I use with it? You can use any PC or MAC navigation software that accepts AIS and GPS data over either a serial port or a TCP connection. For a serial connection you can use the USB port on your Vesper Marine transponder. For TCP you will use the WiFi. Some examples of navigation software that supports the XB-8000 over both USB and WiFi are Rose Point Coastal Explorer, openCPN and macENC. If you know of other PC or MAC navigation software that works with AIS and GPS over WiFi (TCP connection), please let us know so we can have a look at them and spread the word. What about using navigation software on a PC or MAC that only works on a serial port? You have two options for using navigation software that doesn't support TCP connections. The easiest is to use the USB port on your Vesper Marine transponder. When you install the USB drivers (downloaded from above) and then plug in your transponder, the driver creates a "virtual com port" on your computer. It will assign it a name like COM9. You then configure your software to use that port at 38,400 baud. 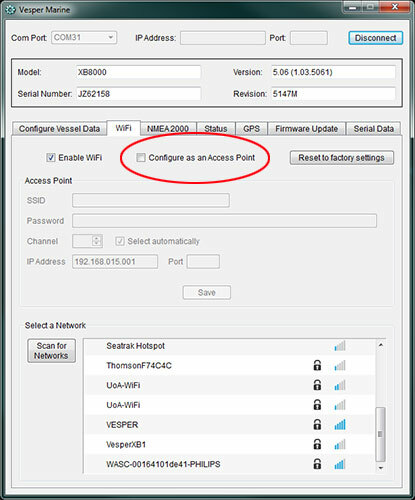 Another option is to use WiFi to connect your computer to your Vesper Marine transponder. Then use software to create a "virtual com port" on your computer from the TCP connection. We've recently tested free HW Group VSP3 Software and found that it works well for this purpose. If you have an installation question, need advice on antenna selection, or are having a problem and need troubleshooting advice, please consult our frequently asked questions. Contact your dealer for local support. Authorized Vesper Marine dealers are always there to assist you with in-depth product knowledge. Or you may contact us for technical support by sending an email to [email protected]. We'll help you with any problems or questions you might have. We constantly hear that we have the best technical support in the marine electronics industry and are ready to help you when you need it. Your Vesper Marine product is protected by a two year world-wide warranty. A summary of the warranty is included in the Installation Guide and you will find the full details here. For information on the relevant standards, please see the Declaration of Conformity. Are you looking for something else? Please tell us what you are looking for so we can improve this page. smartAIS, AIS WatchMate, WatchMate Vision, WatchMate Wheel, DeckWatch, Virtual AIS Beacon, "Always On, Always Visible, Always Watching" are trademarks or registered trademarks of Vesper Marine.